Over the past week, there have been two devastating terror attacks. 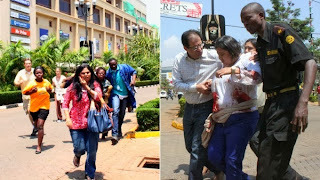 The Nairobi shopping mall shootings included many Western casualties and have been widely reported. The other attack, on a church in Pakistan, has barely rated a mention. A cynic might suggest Western media regard the shedding of the blood of brown-skinned Catholics by the Tehrik-i-Taleban Pakistan ("Student Movement of Pakistan" or the Pakistani Taleban) as less newsworthy than the murders of Westerners by the Somali Harakat al-Shabaab al-Mujahideen ("Movement of Striving Youth" or al-Shabaab). But that is a discussion for another time. What matters now is that we have two sets of victims struck by effectively the same perpetrator inspired by the same demented ideology. Whether the Pakistani Taleban or al-Shabaab, what we have is a global ideology seeking to impose its own demented political theology by force. Like its al-Qaeda colleagues, the Pakistani Taleban rarely discriminates on the basis of religion. Though calling itself an Islamic group, it will happily spill Muslim blood. Shia mosques and neighbourhoods have been subjected to suicide bombings. Sunni security personnel, soldiers and innocent civilians have been blown to bits by suicide bombers. 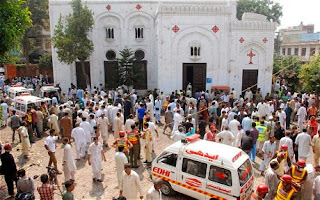 But its most recent attack on the All Saints Church at Kohati Gate in Peshawar deliberately targeted one of Pakistan's most disadvantaged faith communities. The service had just ended and the 400 worshippers were leaving the building when two suicide bombers detonated their devices. Eyewitnesses reported around 100 parishioners lay in pools of blood. At least 80 were dead, more then half of them women and children. It was the worst attack on Christians in Pakistan's history. The church was built in 1882 on the design of a mosque, with a dome and minarets. It is one of a handful of churches that service some 60,000 Christians in Peshawar. Pakistanis are dying in large numbers, mostly at the hands of religious militants who insist that their war is with America and not with us. One does not understand the logic of this. But it is an ideology that finds favour with many. Pakistan is a country where there is too much tolerance for intolerance. On the same day as the church bombing, a mob in the Punjabi city of Sialkot threatened to remove the minarets of an Ahmadi house of worship. The Ahmadis are a small sect regarded by law as non-Muslims. Their houses of worship cannot be called mosques. When the mob threatened to attack the Ahmadi building, police themselves tore down the minarets. And so a church in Peshawar can have minarets but not a Ahmadi house of worship. Pakistan is a country in which all kinds of excuses can be found for division. The Taleban need not try very hard to sow chaos. The chaos is already there. So often Pakistanis complain about American drone attacks. And rightly so. But more Pakistanis are murdered in sectarian violence than by drone missiles. The Taleban temporarily ruled parts of Pakistan before being driven out by the army. In this respect, they have something in common with al-Shabaab in Somalia. According to a 2011 report by Ron Wise of the Centre for Strategic and International Studies, the militia started its life aligned to a moderate (or rather, somewhat less extreme) Somali Muslim party called the Islamic Courts Union (ICU). Before that Somalia was a basket case where competing warlords committed all kinds of atrocities against civilians. Religious leaders in the Somali diaspora are almost unanimous in their condemnation of al-Shabaab. In Minnesota, home to the largest Somali community in the US, local imam Abdul Hashi told journalists, "This type of activity, the killing of innocents, has no basis in, or relationship to Islam," and cited the Koran: "Whoever kills one soul, kills all of humankind, and whoever saves one soul, saves all of humankind." Which makes the actions of al-Shabaab and the Pakistani Taleban pure evil. Irfan Yusuf is a Sydney lawyer. First published in the NZ Herald on 26 September 2013. If a day is a long time in politics, how long would one describe a decade? This was roughly the period of John Howard’s prime ministership, which ended in such a spectacular fashion last November after a bunch of Liberal Party apparatchiks were caught out spreading a bogus pamphlet containing the kinds of messages John Howard’s favourite columnists and shock jocks were famous for. A decade is also the period spent by both John Hyde Page and yours truly in the NSW Young Liberals. In my case, “double dipping” rules meant one could still be an adult member of the Young Libs (the cut-off age was 30) and the “senior” party simultaneously. It was also a time when Young Libs gatherings were dominated by all kinds of adult activities, including the sort of activities one might see in an adult movie. Not that I’ll admit to watching any such activities (even in the movies). Young Libs (especially the self-styled moderates) have often seen themselves as the conscience of the Liberal Party, criticising conservative excesses in both the “senior” party and Liberal Parliamentarians. It was a Young Liberal who tipped off ALP campaigners in Lindsay about the “Ala Akba” pamphlet, triggering off a sting operation that led to the prosecution of senior Liberals including a member of the NSW State Executive. John Hyde Page spent much of his sojourn in the NSW Young Libs fighting my old political allies. 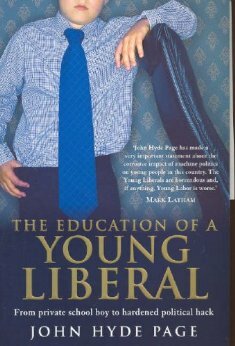 Many of the events he describes early on in his The Education Of A Young Liberal are ones I participated in toward the end of my active membership. At the time, we thought we were making Australian political history. Reading Hyde Page’s book confirmed in my mind just how silly we were to entertain such political fantasies. For a man of his age, Hyde Page has produced a surprisingly mature account of the operation of political structures within the Liberal Party. Certainly any young moderate who saw (and still sees) the stranglehold of the religious right in the NSW Young Libs will succumb to premature ageing. Yet Hyde Page’s work is not a serious or pompous tome. Indeed, even a former conservative warhorse like myself found many occasions to laugh at factional stoushes which at the time were the source of political bipolar disorder – the elation of a successful branch stack followed by the depression of finding out the Annual General Meeting of the stacked branch had been knocked out for technical reasons. The book was the subject of at least one defamation action brought by conservative party members. The offending chapter, provocatively entitled “Meeting With Nazis”, didn’t exactly provide glowing references to some of my old factional allies. Hyde Page describes some rightwing cadres he met as “spruiking enthusiastically like a used-car salesman”. He writes of the Machiavellian-ness of one conservative hack in these terms: “I got the impression that you never found out what [he] was really thinking, no matter how much time you spent with him”. To his credit, Hyde Page doesn’t reserve his often devastating wit on his former opponents. In this respect, his work describes not just inter-factional warfare but also intra-factional intrigue. Much of this was played out in the context of two highly contested preselections in the blue ribbon eastern suburbs seat of Wentworth, now held by Liberal Party leadership aspirant Malcolm Turnbull. Wentworth changed hands twice during Howard’s term in office. It was first held by former Tourism Minister Andrew Thomson, a member of the conservative wing. Thomson was the subject of a preselection challenge from former Young Liberal President Jason Falinski, a moderate. Hyde Page actively assisted in branch development (read stacked branches) in the Wentworth electorate against Falinski and in favour of another moderate, former Liberal Party President and barrister Peter King. Hyde Page and his allies’ brazen tactics included holding a barbecue at the University of New South Wales during which free beer and sausages (financed from a factional slush fund) were handed out to students who agreed to fill out membership forms. He was rewarded for his efforts by Peter King MP in the form of employment in King’s electorate office. To say that Hyde Page’s anti-Falinski role made him persona non grata with many in his own faction would be an understatement. His status was only made worse with many of Hyde Page’s new moderate opponents supporting Malcolm Turnbull’s tilt for the seat. You don’t need to be an expert on factional politics or the operation of political parties to enjoy this work. Hyde Page colourfully describes such dark political arts as branch-stacking, ballot-rorting and constitutional hair-splitting. Hyde Page’s flippant, humorous and highly engaging writing style would have to make him the closest thing to a more conservative Mungo MacCallum, or perhaps even a less conservative PJ O’Rourke. Not a bad plug from a former factional opponent! This review was first penned in 2008. It is finally seeing the light of day after accidentally located on an external hard drive at the bottom of a pile of papers in the author's exceptionally messy study. Tony Abbott has been handed a resounding victory but he is likely to inherit major problems in the Senate. Back in the 1980s, when I was an innocent Sydney teenager, politics was so much simpler and hence so much more boring. We had Labor and we had the Liberal/National Coalition. Labor behaved as Labor should, while the Coalition were as conservative as expected. There was also a third force, called the Australian Democrats, who were boring as all buggery and whose sole responsibility was to "keep the bastards honest" in the Senate. Exactly how this was done went right over my young head. These days, Labor is behaving like the Coalition while the Coalition's rhetoric sometimes makes me wonder whether they are channelling Genghis Khan. Instead of the Democrats, we have the Greens and a host of independents who often hold the balance of power in the Senate and can make governing almost impossible. The last six years has seen Australia's Labor Government at war with itself. In 2010, Australians went to the polls, facing an ostensible choice of Labor's Julia Gillard and the Coalition's Tony Abbott. They got a hung Parliament. A handful of independents went with Julia Gillard to form a weak Government. But over the weekend, the nation decided they wanted a break from unstable government hamstrung by fringe interests spoiling the law-making process. Tony Abbott was handed a decisive victory. Kevin Rudd, who stabbed Julia Gillard in the back after she stabbed him in the back, just managed to hold his seat. 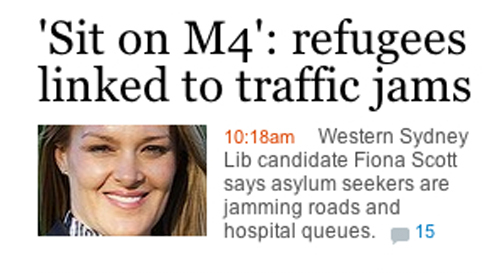 [Asylum seekers are] a hot topic here because our traffic is overcrowded." When asked to clarify, she replied: "Go sit on the M4 [freeway], people see 50,000 people come in by boat - that's more than twice the population of [western Sydney suburb] Glenmore Park. And I thought all the traffic at Bondi beach was the terrible Kiwi drivers. Scott comfortably won her seat. Tony Abbott has a huge majority in the House of Representatives. He can easily form a government but he has no control over the Senate. Few governments ever have had a Senate majority, but at least they've known who they must negotiate with. But this time around, the Senate looks likely to have an undisciplined unrepresentative selection of minor and single-interest parties holding the balance of power. In NSW, a mega-libertarian bunch calling themselves the Liberal Democrats confused a swag of Liberal voters. Voters had to complete a Senate ballot paper big enough to wrap around like a sari. The Liberal Democrats were fortunate enough to be placed first on the ballot paper. Their incoming Senator David Leyonhjelm, a former veterinarian, told Fairfax Media, "Looks like I'm going to be the senator for the donkeys". Leyonhjelm supports a virtual flat income tax, freedom to carry concealed weapons, an end to bicycle helmets and rolling back the "nanny state". The madness doesn't end there. In May 2012, billionaire mining magnate Clive Palmer approached the Coalition to run as a candidate in the seat of then ALP Treasurer Wayne Swan. Mr Swan's response was: "The Liberal Party, particularly in my home state, is a wholly owned subsidiary of Mr Palmer". Palmer was a major donor to the Coalition. When he fell out with the Coalition and formed the Palmer United Party (PUP), the eccentricities only multiplied. 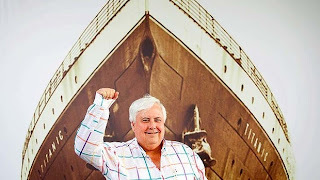 In China Palmer is building a massive ship, the Titanic II, which will retrace the ill-fated voyage of its predecessor. He is also developing his own Jurassic Park on the Sunshine Coast which will contain 160 giant dinosaurs, each of which can move and make some loud noise. After the election, Palmer and his party will make some serious noise in Canberra. His private jet, painted with PUP colours, has made some noise in the sky. He is still in with a chance to win his Queensland Lower House seat, and there will be at least two PUP senators as well. One of them is rugby league legend Glenn Lazarus, nicknamed "The Brick With Eyes". Sounds like a formidable senate negotiator. My favourite? The Australian Motoring Enthusiast Party (AMEP) in Victoria who look set to pick up a Senate spot after achieving a whopping 0.52 per cent of the primary vote. Candidate Ricky Muir is just your ordinary Aussie bloke who doesn't mind uploading videos on YouTube of him throwing kangaroo poo at his brother. 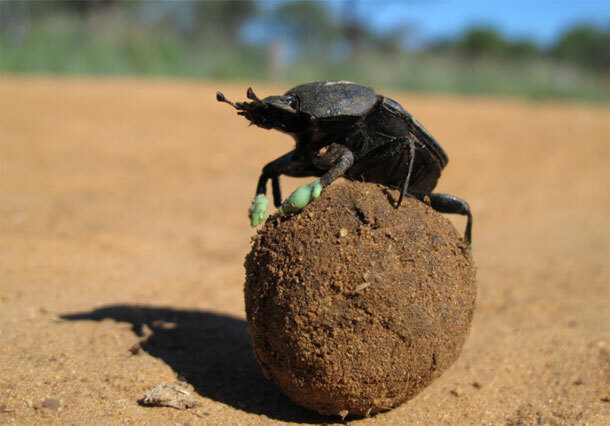 Muir, who has had a long stint in politics with his 3-month AMEP membership, told ABC: "If you haven't spent much time in the bush, you go out there and you'll discover that there is poo everywhere." I guess they don't call Canberra the bush capital for nothing. Tony Abbott is going to have a hell of a time negotiating with the motley crew likely to inhabit the Senate. Irfan Yusuf was a Liberal candidate in the 2001 elections. Politically he prefers to be left right out. Everyone knows Aussies love their beer. Those few Aussies like myself who prefer to stay dry can't help but be entertained by beer adverts. And where would Australian cricket be without brewery sponsorship? The two make an awesome team. But recently there have been some divisive (if not downright bigoted) attempts to drive a wedge between the two. Fans of less gentlemanly sports such as the AFL and NRL have come to expect slurs from fans, commentators and officials. We all remember Sydney Swans star Adam Goodes being vilified by a young fan and then by the president of another AFL club. But for the federal election, cricket could have been plunged into a racial scandal. Maybe Australian sport does need some extra time in purgatory after the silly bigoted remarks and attitudes that have the ability to ruin the reputation of Australian cricket. 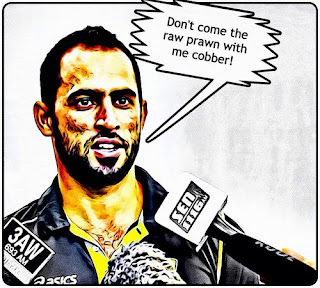 Fawad Ahmed is Australia's next great leg-spinning hope. He arrived in Australia on a short-term visa in 2010 from Pakistan, and then applied for asylum. His original home was the rural district of Swabi near the border with Afghanistan. He'd played cricket at district and first class level in Pakistan. One of his close friends, a local cricketer, was murdered by the Taliban. Ahmed was also threatened, both for his cricket (seen as an irreligious pursuit) as well as for his support of a local NGO pursuing women's rights. 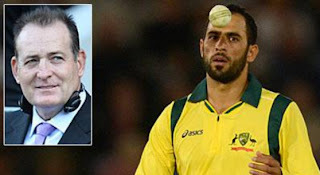 Ahmed's appeal to the immigration minister for refugee status was supported by Cricket Australia. He is seen as possibly the next Shane Warne. While other sports people are famous for consuming drink, snorting powder and/or a not-too-respectful attitude to women, Ahmed's life is an alcohol-free zone. He isn't opposed to playing in a team of mainly beer drinkers. He doesn't mind playing on grounds with CUB placards. 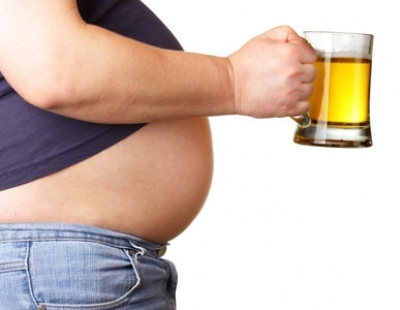 He's a teetotaller, not a teetotalitarian. Cricket Australia did its cultural homework. Chief executive James Sutherland said he approached Ahmed on the recent Australia A series in England. They suggested he may not want the VB logo on his uniform. Ahmed agreed. The arrangement was initially the subject of rational objection. Former Australian fast bowler Geoff Lawson argued that if VB is paying you to play cricket and you don't like it, find another job. Lawson is hardly a religious bigot, having coached the Pakistan national squad and lived in the country. There is a legitimate argument that a professional sportsman whose wages are paid by a sponsor should be part of legitimate efforts to ensure that sponsor gets maximum bang for sponsorship buck. Cricket is no longer a sport dominated by England and Australia. Innovations such as Twenty20 have shifted the power and money of the game to the Indian subcontinent, which boasts national teams from Bangladesh, Pakistan, India, Sri Lanka and Afghanistan. Australia already has a reputation overseas for treating refugees awfully, locking them up for years in virtual prisons and using them as political footballs in election campaigns. A columnist for The National, a newspaper in Abu Dhabi, recently wrote that ''Australia has just voted in Tony Abbott as their new prime minister, whose not-so-nuanced approach to handling refugees is to 'stop the boats' and hence that Ahmed cannot look forward to much nuance from Australians if he doesn't score wickets quickly''. Campese's tweet made headlines in sports pages across the cricketing world. South Africa's Weekend Argus reported Campese was suspended as a panellist on TV program SuperSport. South Africans don't seem to mind star batsman Hashim Amla not wearing a Castle Lager logo on his shirt. The irony is that Carlton & United Brewery is quite happy with Ahmed's decision. 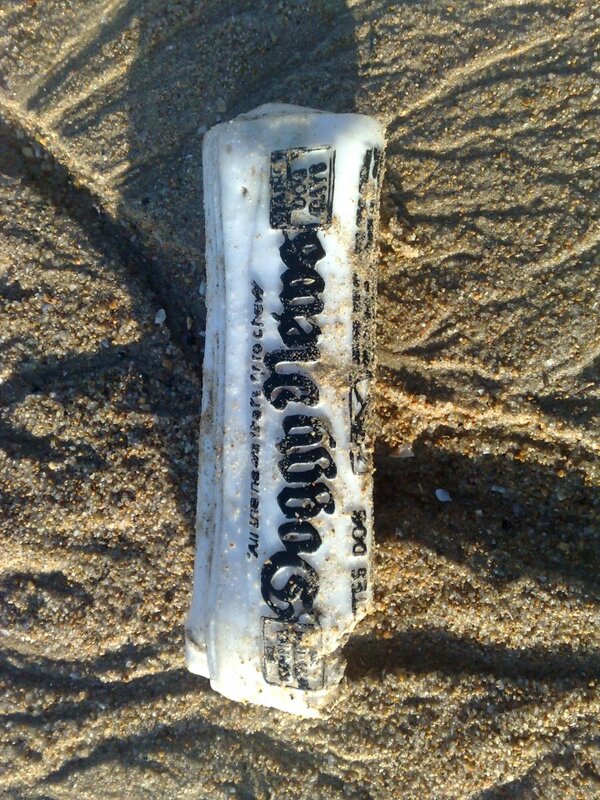 A beer company is showing more sensitivity to clean living ways than some of Australia's top sports people. This and any further controversy can only be good for sales. Irfan Yusuf is an award-winning author and champion armchair cricketer. Germany’s Iron Chancellor, Otto von Bismarck, once remarked: “Numerous politicians have seized absolute power and muzzled the press. Never in history has the press seized absolute power and muzzled the politicians. … talk back radio, where we are virtually left with the world of John Laws and Alan Jones, who dominate their interviews with their own opinions and tend to measure interviewees against those opinions. Often you can only hope to get a word in if you happen to agree with them. Muslims around the globe are joining protests on streets and on social media against military takeover. Protests have spontaneously erupted in cities across the Muslim world, from Istanbul to Lahore to Jakarta. Apart from some clashes with police, mostly the protests have been peaceful and matched by parallel protests on Twitter, Facebook and other forms of social media. 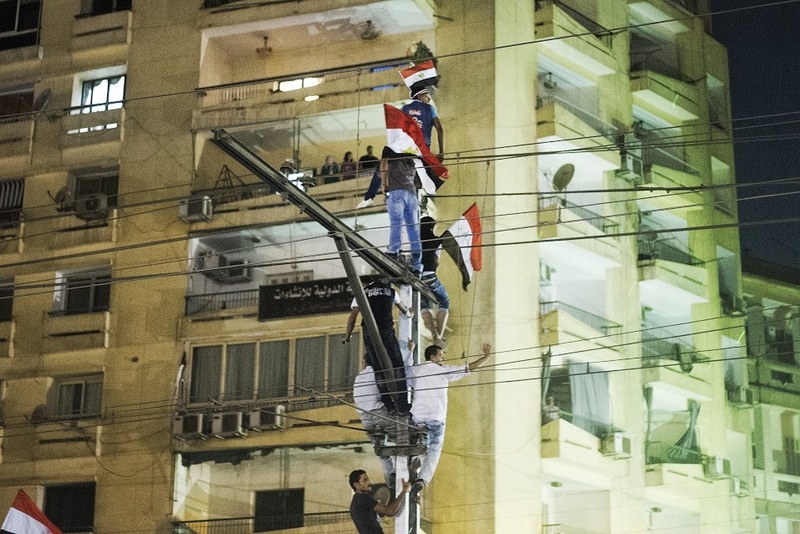 Meanwhile, photos of the dead and the living in Egypt's nascent democracy are going viral. There is a photo of Habiba Ahmed Abdel Aziz, a multimedia volunteer for the Muslim Brotherhood standing in the crowd holding a camera on small stand. Next to this is a photo of her lifeless face in a white shroud. But it isn't just ordinary Egyptians being murdered by a military that each year receives millions in military aid from the US. Soon news spreads across cyberspace that an Egyptian athlete who won bronze at the London Olympics is among the dead. The 17-year-old daughter of a Brotherhood leader is filmed being cut down by a sniper. Indeed, Egypt's counter-revolution is being televised to those who care to watch. 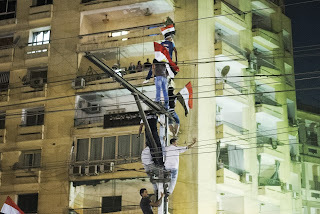 Egyptian protests are making international headlines while their parallel international equivalents are being ignored by our allegedly honest independent Western media outlets. Indonesia, the world's most populous Muslim nation and perhaps Asia's most vibrant democracy, has close spiritual ties to Egypt, home to Al-Azhar University in Cairo, perhaps the most Sunni Muslim seminary in the world. Large numbers of Indonesian religious scholars are Al-Azhar graduates. Egyptian religious culture is regarded as reflective of the epitome of orthodoxy in many parts of the archipelago. Hence Indonesians have hit the streets following the 3 July coup. The United States prefers not to use nasty terms like "coup" to describe the military removal of a democratically elected government followed by a massacre of its citizens. To do so would threaten its ongoing $1.5 billion military aid package to the Egyptian military which underpins the Camp David Peace Accord with Israel. Protecting the security needs of the only democracy in the Middle East is far more important than supporting nascent democracies in other Middle Eastern nations. Or to quote the Israeli ambassador to Cairo: "Al-Sisi is not a national hero for Egypt, but for all Jews in Israel and around the globe." The United States and Israel have a firm ally in the democratic moderate secular nation of Saudi Arabia. The last thing Saudi's absolutist absolute monarchy would want is a host of Arab springs in its own backyard. At first, Saudi Arabia's role in Egypt's democracy was to act as puppet master for the Salafist faction. Saudi Arabia has now directed its Salafist allies in Egypt to back the Egyptian generals. It is also using its influence in the Arab media to flex its muscle. In Kuwait, well-known preacher Tareq el-Swaidan has been sacked as director of a Saudi religious channel due to his Brotherhood links. The Saudi prince Al-Waleed bin Talal wrote on Twitter that Mr Swaidan had been dismissed "for admitting he belongs to the Brotherhood terrorist movement". The Saudi dictatorship has pledged $5 billion to the military junta. The mastermind behind the military takeover and massacre is hardly a staunch secularist. General Abdul Fattah el-Sisi was appointed by former President Morsi in August 2002 to head the Supreme Council of the Armed Forces (SCAF). Sisi was trained in Egypt, the UK and the United States. Unlike other SCAF members, Sisi is a deeply devout man. Despite the support it is receiving from the US, Sisi's military rulers are flooding the country with anti-American propaganda, claiming that the US Government and media are supporting the protesters. Successive military regimes have used this kind of paranoia to deflect attention. Egypt is moving forward headlong into the past when elected presidents won polls with 99 per cent of the vote. The Brotherhood's Mohammed Morsi wasn't perfect, but he was Egypt's first elected President. Egyptian media were free to lampoon him without risking imprisonment and torture. We now have no idea where Morsi is being held. On the other hand, former military strongman Hosni Mubarak, the man overthrown in Egypt's revolution who faces trial, has been released. In the long term, Morsi's opponents have little option but to rally not only around the army but possibly their original nemesis. Egypt's anti-Brotherhood liberals have proven to be democracy's worst enemy and the army's best ally. As an electoral force, they proved disorganised, unable to agree on a presidential candidate to oppose the Brotherhood. They seem only able to unite against a power, not for a cause. In Egypt, liberals have given up on liberal democracy. First published in the New Zealand Herald on Tuesday August 27 2013.